When they made this particular hero they didn’t give him a gun they gave him a screwdriver to fix things. They didn’t give him a tank or a warship or an x-wing fighter they gave him a call box from which you can call for help. And they didn’t give him a superpower or pointy ears or a heat ray they gave him an extra heart. They gave him two hearts. And that’s an extraordinary thing; there will never come a time when we don’t need a hero like the doctor. The most recent doctor who episode “Listen” dove directly into the identity of this new Doctor (PeterCapaldi) in a curious way. He’s a bit chaotic, strained, and quite frankly mad (but we’ve always known that). In a retroactive kind of alteration so typical of Moffat, we also got a great deal more from the childhood forces that shaped the man we’ve come to know so well. Time’s a funny thing, how something in the future can shape everything from the past. And it was always that way. We just didn’t know it until now.The opening scenes set up the premise deftly and answer the question we’ve all wondered: what exactly does our favorite Time Lord do in his spare time in between the snapshots we get of his travels (you know, those things we call “episodes”)? He’s got years and decades that are unaccounted for. Maybe even centuries. This was a thought that didn’t really click for me until “Boom Town” from series one. Yes, this show is rather procedural, but there is a LOT that happens in between the episodes we see. “Boom Town” opens on the full gang The Doctor, Jack, and Rose meet Mickey and Cardiff and pretty much just hang out for the afternoon while theTARDISrefuels at the Rift. The Doctor has a full troupe of friends in tow! They laugh uproariously about some adventure we never saw. It’s wonderful. We love it. The Doctor’s glowing. Take a look at it. We won’t really see that kind of bubbling joy again until either “Journey’s End” just after victory or the beginning of “Angels Take Manhattan.”We know for sure that the 11th Doctor lives for several hundred years before he even sets foot in the town called Christmas. Generations of humans are born, live, and die while The Doctor keeps going. In “Listen” we come to see a wandering Doctor spouting out hypotheticals to himself in the TARDIS. This is what he does as a hobby. He talks to himself, gets all in a fuss, and may or may not hallucinate to an extent. (Keep in mind, it was Amy’s goodbye wish that he never travel alone, at least not for long. Because when he does we get a darker Doctor capable of terrible things (Re: “Water on Mars”). In this season more than ever, we see The Doctor with a companion he isn’t even really “traveling with”. He scoops her up when he needs her. Clara doesn’t really cling in the way Amy or Rose did (Amy admittedly laid off a bit in the later years). Clara is largely her own person, an independent figure that is also so important to the doctor’s life lives that she is able to influence his timeline more than any past companion. Without her, the Great Intelligence would have consumed The Doctor altogether. Without Clara, the Daleks would have destroyed Christmas and all of Trenzalore with it. Without her, there would be no more Doctor at all. Beyond these direct actions, she’s always there, whispering influences. She was there to tell him which TARDIS to take. She was there at a million, billion, impossible instances saving the Doctor over and over. And she was there at his bedside to quiet his boyhood fears. Every companion has their moniker. Amy was the Girl Who Waited, which you sort of forget by the end, but we aren’t given even a few episodes to forget that Clara will always be The Impossible Girl, you know, doing all of these timey wimey wonderful things. “Listen”: When The Doctor is spitballing to himself like the madman he is, he believes he discovers a type of creature living in the shadows of the universe, one that attaches to living beings and causes the same nightmare that has been mentioned across time and space. Wait. Moffat: is it the monsters causing the nightmare? Or did the Doctor project his “nightmare” real life experience through the time vortex in some timey wimey way? Was any of that really there? Hmm? Moffat, intentionally or not, fails to answer our questions in order illustrate the point that mystery is more powerful than certainty. This is more than a truth in storytelling. It is a fact of life. Though the episode never really addresses what was actually under that blanket or what actually was turning off TV’s and writing the word “LISTEN” in chalk, it comes around to the eventual point quite clearly that none of that really matters. What DOES matter is that long ago there was a scared boy on Gallifrey that was afraid of the dark. They never thought he’d make Time Lord. And if the former headmaster of Hogwarts imparted any wisdom upon us at all, then it comes with his erudite assessment that “It is the unknown we fear when we look upon death and darkness, nothing more.” The Doctor is a man that yearns for knowledge, to know things for certain and to understand the way things work. It’s for that reason that he risks his own life halfway through this episode just to see if those creatures are really there at the end of the universe. Certainty is worth more than safety to him. I apologize. Two Harry potter references is probably too much. You never see an inherently good person trying to be bad. Why? It’s only ever the opposite, or more accurately, imperfect beings struggling to fulfill the ideals they’ve established for themselves. This is true of The Doctor as much as it is for us. It’s just as true for Danny and Clara on their overwhelmingly crisply written date. They’re both awkward and overly sensitive and trying so hard to like each other and make it work but it just won’t. It won’t at all. Because she’s hiding something and because he can’t deal with it. He’s got a past. She’s caught up in a double life in the present. Do they have a chance at a future together? The answer? Only if they genuinely try, and admit all these things to themselves and to each other. It’s fitting that Clara is a teacher. Her sincere compassion is the kind that can alter a child’s life for the better, sending reverberations across their timeline, if you will. She does it to a young Rupert (to be renamed Danny). The Doctor only further scares Rupert when a creature lurks on the bed. He’s terrible with kids, probably because he’s afraid that they’ll realize he’s still that same scared little kid inside, even though it’s been a millennia. It takes Clara to comfort Rupert, (even if her tale about Dan Dan the Soldier Man winds up being a self-fulfilling prophecy that indirectly makes him into a killer…but at least that was an accident). As a child, I too was afraid of the dark. The creaks were footsteps. The winds were whispers. Every dark corner hid a shadowy edge oto some monster out to devour me. “It’s all in your imagination!” my mother would plead. I’d say it to myself over and over and over and over again. One day it just clicked. Everything changed the day I realized that not only were those monsters there in my imagination, but so were all the heroes I read about in stories and played in video games and watched on TV. They could stand guard for me while I slept! Tireless. Protecting me against the dark. The kind of power that can shape our lives and shield us from our own fear. 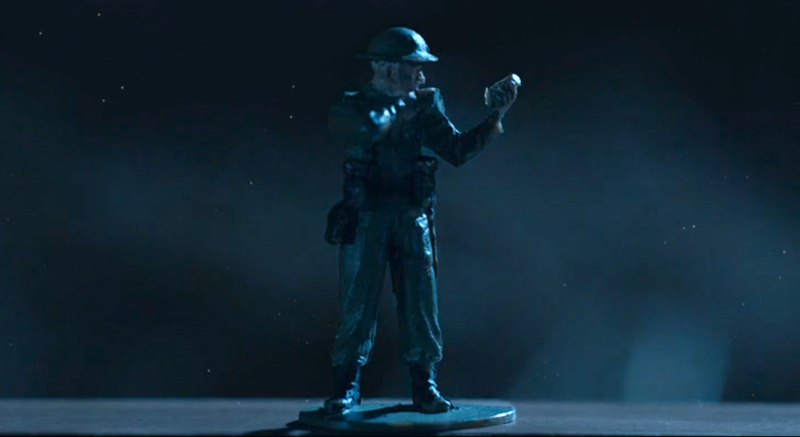 The toy figure of Dan the Soldier Man is the show’s best use of symbolism to date. Not only does it forge the link between Clara and Danny via Orson, but it is at once both Doctor and Danny, as a symbol of what both men will become. A soldier without a gun. A soldier with a heart (or two), who heals more than he hurts but will never back down from fiercely protecting those he loves. Because of what happens throughout the course of the episode, Clara turns both of them into that. And how fitting that this symbol of hope given to both is not the neutered symbol of a soldier with no weapon, but a warrior so smart and brave that he doesn’t need one. It’s episodes like “Listen” that revitalize the series by giving us an exciting new mystery while also delivering a fresh perspective on The Doctor’s past. Easily one of the best in awhile! I think this might have been the best ever since 2005.